#51 "Triax 2 - Weapons Locker, Wolf Blood, Splicers"
The Rifter is your doorway to unlimited imagination and numerous Palladium role-playing worlds. It offers new heroes, powers, weapons, magic and adventure for your games. It presents new villains, monsters and dangers to battle, and new ideas to consider. 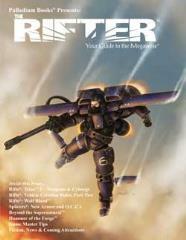 Rifts Triax 2 Weapon Locker – Brandon Aten has prepared new, official source material for the Triax™ 2 setting. Rifts Vehicle Construction Rules, Part 2 – More construction rules for building and modifying vehicles by Greg Diaczyk. Splicers: The Metamorph and Swarm Lord – two awesome new O.C.C.s and a ton of powers for Splicers by Chuck Walton and Chris Kluge. The latest chapter of Hammer of the Forge, fiction. News, coming attractions and much more.